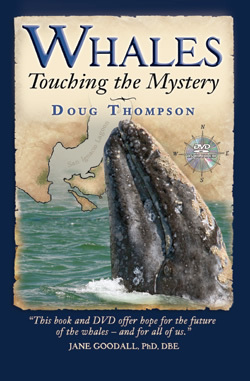 In this set of book (160 pages) and companion DVD (30 minutes), Doug Thompson shares the unprecedented interaction between humans and the Gray Whales of San Ignacio Lagoon. This unexplained interspecies communication is what Thompson calls “touching the mystery.” He also writes about the people of San Ignacio Lagoon—the keepers of the whales—and their successes with creating livelihoods from eco-tourism, while still protecting the whales and their environment. Thompson weaves a fascinating story of personal accounts, his own and others, along with factual information on the world of whales. To view an excerpt from the companion DVD, click here. We provide books wholesale. Call us at (760) 832-4397 or email: doug@dolphinworks.com. You may request personalized, autographed copies from Doug for guests on your events. You may place an order with your credit card or by check. Doug Thompson has traveled internationally as a marine naturalist for more than thirty years. The Los Angeles Times describes Thompson as an “environmentalist extraordinaire,” who has led more than one hundred long-range natural history expeditions from Mexico to New Zealand. 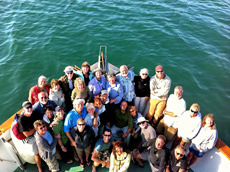 Since 1977 Thompson has led expeditions to the Gray Whale birthing waters in San Ignacio Lagoon in Baja, Mexico. With this book and DVD, he tells the story of the Gray Whales of San Ignacio Lagoon and the local people who have lived on the shores of the lagoon for generations. Thompson is the Director of Expeditions for the SummerTree Institute, a non-profit environmental education organization based in Southern California.